The event taking place at Head Start centers throughout the county on April 25 is open to all local families. Reading to the children is a favorite activity when parents volunteer in the classroom. 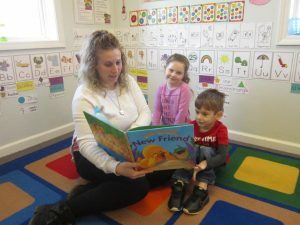 Cierra Bolton, parent at Oswego Head Start, is reading to a student, Myla Shatraw, and her son Landen Bolton-Shatraw (pictured left to right). Hands-on literacy activities are planned for children age’s three to seven. These exciting activities are based on Carle books, such as The Grouchy Lady Bug and The Very Busy Spider. The Very Hungry Caterpillar, which was written in 1969, is celebrating its 50th year in publication. “Developing early literacy skills makes it easier for children to learn to read in school. Children who enter school with these skills have an advantage that stays with them throughout their school years,” said Christina Mills, program coordinator at Literacy Volunteers of Oswego County. Carle is an American author/illustrator of many popular children’s books such as Brown Bear, Brown Bear, What Do You See? written in 1967. He has illustrated more than 70 books, most of which he also wrote. His roots are tied to Central New York, as he was born in Syracuse in 1929. 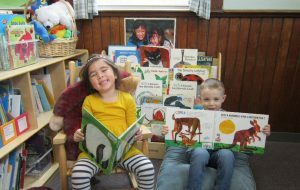 Pinewoods Head Start students Ava Belen (left) and Andin Whittaker (right) are enjoying reading Eric Carle books in the classroom. Books and reading are incorporated into all parts of the day and contribute to school readiness. All families will receive one Carle book (while supplies last) and each child will enjoy a theme related snack. Fulton Center, All Saints Church, 153 S. First St., 5:30 – 7 p.m.
Fairgrieve HS/UPK, Fairgrieve Elementary (rooms 106 and 107) 716 Academy St., Fulton, 5:30 – 7 p.m. Discovery Learning Center/Phoenix HS/UPK, 80 County Route 59, Phoenix, 6 – 7:30 p.m.
North Shore Center, Life Church, 2363 State Route 49, Central Square, 5:30 – 7 p.m.
Oswego, Fort Ontario, Building 31, 45 E. Schuyler St/, 5:30 – 7 p.m.
Pinewoods Center, 2798 County Route 57, Fulton, 5:30 – 7 p.m.
Williamstown Center, 2910A County Route 17, North, Building A, 5:30 – 7 p.m. The Head Start program was established in 1965, celebrating 54 years this May, and has served well over 900,000 children nationwide. It is the oldest running school readiness program in the United States. OCO Head Start serves 3 and 4 year old children at 7 centers throughout Oswego County. The program is provided at no cost to families. Head Start provides comprehensive services which promote school readiness through hands-on learning experiences. Children receive nutritious meals and snacks daily. Each Head Start classroom includes qualified teaching staff including a teacher with Master’s or Bachelor’s degrees in education, a teaching assistant and a classroom aide. Head Start families receive additional support through a family specialist, cook and nurse at each center. Head Start accepts applications for children ages 3-4 throughout the year. Waiting lists are maintained for openings that may occur during the school year. Those interested in learning more about the Community Literacy Night event or Head Start enrollment, please call 315-598-4711, and toll free at-1-800-359-1171. OCO serves over 28,000 people each year through more than 50 programs operating in over 80 locations throughout Oswego County.